This made the removal of the resin MUCH easier than last time and had no adverse affects on any of the components. Therefore, I highly recommend leaving your chip/s soaking until you can see the resin splitting away from the ceramic base (typically between two to five days). Next up, we’ll solder new pins to the chip. For this, I used sections of SIL (Single In Line) IC socket strip which should be readily available from most electronic components stores. In Australia, I purchased this from Jaycar Electronics. The strip I purchased comes in 32 pin lengths and is simply cut to length (12 pins wide) with a pair of side cutters. Pin 11 is also cut off with the side cutters to match the Module Board and the chip. Cut two strips in like manner. We’ll be soldering the second strip into the Module Board to make any future repairs MUCH easier. This next step is optional but highly recommended if you have the necessary soldering skills. We are now going to resolder everything on the chip (make sure you resolder the 11 main pins on the white part of the chip too). Make sure you use 60/40 tin/lead solder for this. DO NOT use lead free solder. It is not legally necessary because you are repairing a product that originally contained lead solder. Lead free solder melts at a higher temperature, is more difficult to work with, is less reliable and can result in overheated components during soldering. These components were NOT designed for high temperature, lead free soldering! This also applies to the soldering we will be doing on the Module Board too. If you have the necessary skills and experience for surface mount work, you will already know to keep the components as cool as possible. Solder a couple of pins on one IC, move to another one and do the same, let the board cool and then move to another IC (there are three on these chips). Continue until you’ve resoldered all the ICs and then do the same for the chip capacitors and the two solid links. Again, you’ll need a fine tipped soldering iron for this. If you happen to short out two pins, GENTLY use a good quality vacuum desoldering pump to remove the excess solder (or use a professional, temperature controlled, vacuum desoldering station which I have since purchased) and then resolder the joints. My desoldering pump is a Japanese one made by ‘Goot’ which I also purchased from Jaycar Electronics. 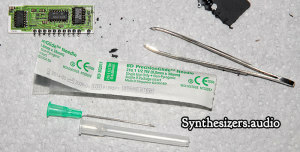 The desoldering station I have since purchased is one of these. 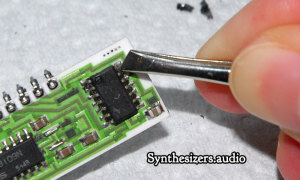 Make sure you inspect your work CAREFULLY with a magnifying lamp for further shorts which could easily damage the chip and/or your synth. Shorts like the one below are obvious but it is easy to create very subtle shorts when working with SMD boards which can also be VERY easy to miss. Use the magnifying lamp and DOUBLE CHECK your work! 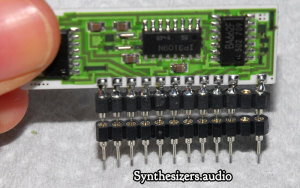 In part 3 we will remove the remains of the old pins from the Module Board, prepare the Module Board with the new IC sockets, fit the repaired chips, fit the Module Board back in the synth, test everything, do the synth alignment and put the screws back in the repaired synth. Having read your wonderful instructions for rejuvenating the Juno 106 voice chips I intend to go the socketing route you describe. I wonder if you could answer a question? Do the SIL strips you show actually act as both male and female? 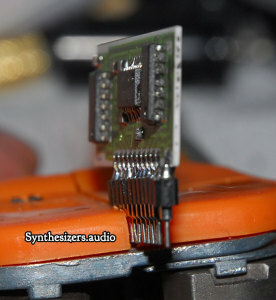 It appears from your photos that you plugged the male end into the female end, and also soldered the male pins to the PCB and soldered the pins of the voice chips into the female parts. If so this a beautifully simple and easy way of doing things, but I wonder if that is how the SIL strips were designed or is it something you’ve devised? Thank you kindly for the compliments on my instructions. In reply to your question, yes, indeed that is exactly what these SIL strips are. They are designed as PCB sockets to make SIL ICs removable. This makes future removal and replacement of the voice chips very easy if needed and is one of the primary reasons for using them. I wondered how long it would take for someone to comment on the Vegemite jar. I actually used that jar deliberately to see if anyone would notice. Good to see a fellow REAPERite over here too. 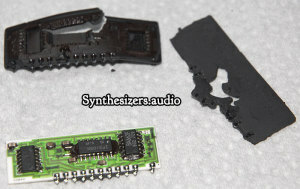 I used nail polish remover, acetone and the chips on the board appear to be eaten too..
Yikes! There’s no doubt other things besides Acetone in the nail polish remover. I only recommend using 100 percent pure Acetone. I hope you haven’t soaked all six of your chips in that stuff!!! This guide is very well put together and informative. Exactly what I was looking for before tackling this job.Thanks David! Thanks for your positive feedback Chris. All the best with your Juno.